Don’t know where to go for the next long weekend? 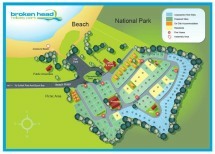 Well that’s easy-come to Broken Head Holiday Park! Broken head has so much to offer this long weekend with secluded surfing beaches and tranquil nature trails, how can you go wrong. June is the perfect time to come to Broken Head because there will be the pod of Humpback whales making their way up from Antarctica to Queensland. The best thing about being the most easterly point in Australia is that the whales migrate right passed our front door and sometimes is only a couple of hundred meters off land. So bring the family for a fulfilled long weekend this June and have a blast. Cabins and sites are filling fast so hurry and book today on our free toll number 1800 450 036. Can’t wait to see you.